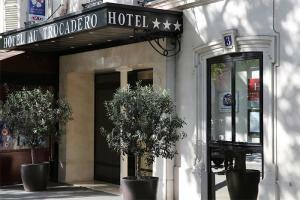 The Best Western Hotel Au Trocadero is located in the prestigious 16th arrondissement, just moments from the magnificent Palais de Chaillot and the Trocadero Gardens. The hotel is conveniently located to, and offers stunning views of, the Eiffel Tower, making it a great choice for your stay in Paris. The 27 guest rooms have been recently renovated, offering harmonious color palettes and thoughtful amenities such as soundproofing, free Wi-Fi, flat-screen TVs and minibars for a comfortable and relaxing stay. Approximately 15.5 miles from Charles de Gaulle Airport; Orly Airport is about 14 miles away. Trocadero Metro station is about a hundred yards away.